Hi all! Today's interview is with James Mendez Hodez on 7th Sea: Khitai, which is currently on Kickstarter. Khitai is a standalone RPG and is exploring beyond the boundaries of 7th Sea's core setting, Théah. There is currently a free, 36-page quick-start on DriveThruRPG. Check out what James had to say below! This is so damn pretty regardless of anything else. Dang. By Shen Fei. 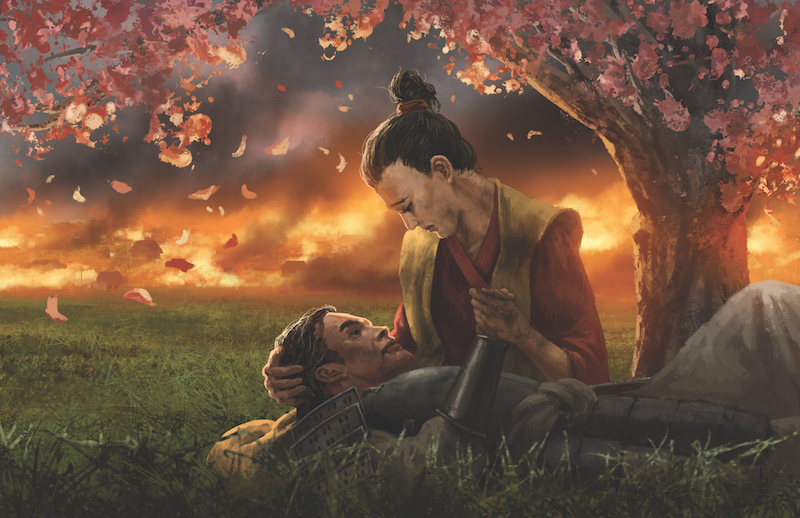 Tell me a little about 7th Sea: Khitai. What excites you about it? The Khitai setting expands 7th Sea’s 17th-century swashbuckling fantasy to Asian, Oceanian, and Pacific settings. I’m excited to represent times, places, and legends close to my heart and my real-life ancestry, many of which have never appeared before in tabletop role-play. Khitai also ups the scale of the game’s heroism: one Hero can lead an outlaw gang in the marshes of Shenzhou, a slave revolt on the peninsula of Han, a pirate fleet in the islands of Tawalisi, or a samurai clan governing a warring state in Fuso. We get to stretch the boundaries of what a Hero looks like and how they can change the world. I know in previous interviews we've spoken about your academic and personal expertise, but I'm curious what new you may have studied, played, or what kind of media you looked at to work on Khitai. What were some specific things you enjoyed reviewing as you've worked on the project? Tell me how they're reflected, at least a little, in the game. Khitai has brought a great deal of new media into my life. Here are a few inspirations that really stand out. The Water Margin Classic, also known as Outlaws of the Marsh, is probably the single most significant influence on Asian swashbuckling adventure in general, and my vision of Khitai in particular. It’s one of Chinese literature’s Four Great Classical Novels alongside the Romance of the Three Kingdoms, Journey to the West, and Dream of the Red Chamber. It’s about 108 martial heroes whose … eventful … lives drive them to join a bandit gang in the Chinese swamps, where they make trouble, rebel against the unjust government, and then ascend to positions of responsibility and authority in a new government. I based indigenous Fusoese religion on The Song the Owl God Sang, a book of folk songs and stories compiled by a young woman of indigenous Japanese ancestry who mysteriously and tragically died hours after she completed it. Fusoese Kamuyru will reflect the sometimes-playful, sometimes-deadly kamuy who rule the land, animals, and humans’ relationships with the foregoing in Ainu thought. the more complicated someone’s hat, the more likely they are to be evil. Han sourcebook cover! By Shen Fei. What are some challenging aspects of creating adventuring type games that travel over sea and in non-Western/Western-assumed settings, in regards to fictionally aiming it towards players and gathering interest? Tropes define a great deal of Western popular media’s relationship with Asian material. Navigating and integrating those tropes into new stuff is tough because so many people have such different assumptions and feelings attached to those tropes. Let’s look at martial arts as an example. If we’re telling a swashbuckling story about Asia, we should of course include martial arts action. But gamers have different priorities about these topics: some players get really excited about fidelity to their understanding of realistic combat, others want to do unrealistic things on purpose, and many gamers are just tired of martial arts storylines because all too often, that’s all there is when it comes to Asian content. Still, Asians developing and excelling at martial arts has a strong basis in both military history and fiction, with characters like Preceptor Droṇa from the Indian epic Mahābhārata or places like the Shàolín Monastery. So we’re going to feature both realistic and unrealistic (but still well-sourced) martial arts action in Khitai; but what we can’t do is perpetuate the stereotype that martial arts are either a) peculiar to Asia and Khitai and not other continents, or b) assumed to be known by every individual Asian or Khitan you meet. Nearly every culture in history (and every culture in 7th Sea without exception) has practiced martial arts; fewer, but still many, have traditions of martial fiction as robust as China’s. Martial arts figure prominently in The Three Musketeers, Things Fall Apart, and The Summer Prince. America’s 52 hand blocks and Nigeria’s dambe are no less effective boxing systems than wing chun or karate. It's okay for tropes (though not stereotypes) to inform and expand our storytelling. It's not okay for them to limit us. Naoko, a young Hero whose home was destroyed by bandits. By Charlie Creber. What are heroes like in Khitai? They’re complicated! To answer that question I want to revisit the Water Margin Classic’s 108 Stars of Destiny, the rebellious outlaws of Liángshān Marsh, because they represent a lot of the internal contradictions I hope to see in Khitan storytelling. They prize honor and loyalty, but they spend most of the story getting drunk and committing crimes for reasons ranging from revenge to boredom. They rebel against the corrupt government, but wind up in positions of authority in that government. This theme comes back again and again in Asian heroic literature: very often the individual who winds up with the job of “hero” isn’t very good at their job, and the one who winds up with the job of “villain” seems way better in comparison. Similarly, the arch-villain of the Mahābhārata, Prince Duryodhana, is a pretty bad guy; but his best friend, King Karṇa of Anga, is the most badass, loyal, and honorable warrior in the entire epic—he just winds up on the wrong side because he’s of mixed-caste parentage, and only Duryodhana is willing to look past it. 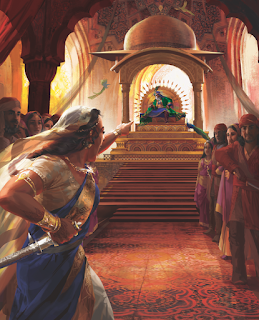 In the final Battle of Kurukshetra, Karṇa’s chariot wheel gets stuck in a rut and he gets out to fix it, reminding the hero Prince Arjuna that attacking him while he’s coping with technical difficulties would violate the laws of honorable warfare. But Arjuna’s charioteer, Lord Kṛṣṇa—who is an avatar of Viṣṇu!—tells Arjuna to shoot Karṇa now because Karṇa’s harder than Arjuna and it’s the only way they’ll ever beat him. So the shining hero shoots the villain in the back, his head goes flying, and that’s how you win a land war in Asia. These are the kinds of problems the players will have to sort out. Or cause. Agnivarsa sourcebook cover. Such drama! By Cassandre Bolan. What has been your favorite part of working on Khitai, in any aspect of the project? The most exciting part of this project has been watching the creative team and the players—myself included—go from knowing nothing whatsoever about certain places and times in history to champing at the bit to play characters from there. John Wick has gone from doubting we could do Korea justice to posting excited links about Admiral I Sunsin on Facebook. I never knew about the Sultanate of Sulu and the Moro pirates until I started reading about them for background on the Kiwa Islands, and now I'm plotting what might be my first ever Renaissance faire costume. A little while ago, a fan posted a sea shanty she’d composed herself with reference to Théans sailing to Nagaja and seeing the elephants there. I get to watch 7th Sea's world grow larger and more colorful one player at a time. This is so cool! By Shen Fei. Thanks so much to James for the interview! Remember to check out 7th Sea: Khitai on Kickstarter, and download the quick start on DriveThruRPG!